From the innovative wheels within the coring path, to the large 122 cm (48`) aeration swath, there’s nothing ordinary about the ProCore® 648 aerator. Years of research, customer input, testing and attention to detail went into making the ProCore® 648 the most productive and efficient walking aerator on the market. 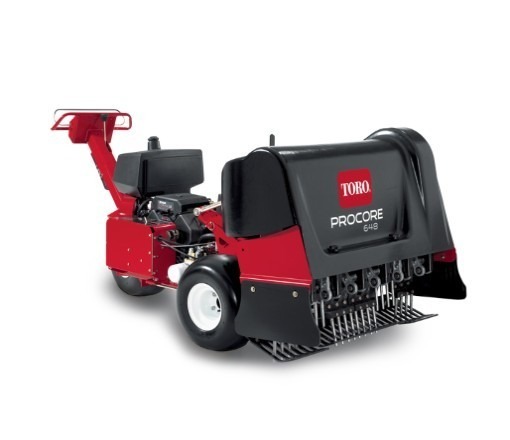 Learn more about the innovative aerator – ProCore® 648! The ProCore 648 is more efficient with a 48 inch (121.9cm) aeration swath that is 50 – 100 percent wider than competitive units. The ProCore 648 allows you to aerate more areas in one day with the 48 inch (121.9 cm) aerating swath and clean up is easier and less labour intensive resulting in less time. TrueCore™ sensing system automatically maintains tine depth on the fly to match the ground undulations providing consistent coring depth of up to 4` (10.2 cm).